The end of the school year later this week marks the official closing of 10 Minneapolis schools. The financially-troubled school district is responding to its shrinking enrollment and excess of classroom space. District officials are combining some of the affected schools and reorganizing others into new grade configurations. When the dust settles this summer, seven school buildings will stand empty. School leaders will then decide on possible new uses. Minneapolis, Minn. — Holland Community School has been a fixture in Northeast Minneapolis for more than a century. The first building went up in 1886. Its replacement opened in 1968. There's a lot of history in the school. As she shows a visitor photos on a display outside the main office, Deb Zepeda speaks with pride about her neighborhood school. She works as the parent liaison at Holland and has three children enrolled in the school. Zepeda is feeling sad about the approaching end of the school year and the end of the school. "I hate to see it go," Zepeda said. "But I understand there's some things that have to be done in the school district. And so you have to make the best of a bad situation." 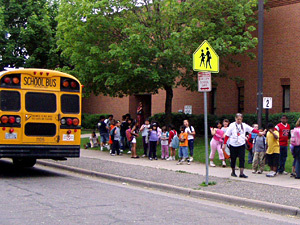 The situation in the Minneapolis is too few school-age children and too many classrooms. Enrollment has dropped by 3,000 students in just the past two years. School district officials say they can't afford to keep their smallest schools open. With only 190 students in kindergarten through fifth grade, Holland was an easy target. Its students and some teachers will move three miles to Waite Park Elementary next year. Principal Gertrude Flowers Barwick and her staff had to change directions after last winter's board of education vote to close schools. "Normally we would be starting the process of reviewing our student improvement plan and making some changes for next year," Barwick said. "Instead, we focused on making sure that we were implementing what we said we would do this year and then getting ourselves professionally ready for the next assignment and then thinking about how we would celebrate." The celebration finally came last week at Holland. Students, parents, teachers and alumni gathered to share food, music and memories. It was an emotional event for Lori Lapoint. She attended Holland, and so did her children. She now has two grandchildren at the school. "It's a neighborhood school," Lapoint said. "Everybody pretty much lives in this neighborhood and they're going to have to be bused someplace else. And they've got a lot of good programs here." Lapoint is also worried about the future use of the school building. District officials have not yet decided what will become of their vacant buildings. They plan to hold a series of community meetings later this year to gather input. Some of the schools could end up housing school district offices or special programs. Superintendent Thandiwe Peebles said there are several appropriate uses. "Say a community center wanted to come here, a multi-purpose community center that would serve the children their parents and have some activities at the end of the day," Peebles said. "We have several universities in this town. Say a university wants to put a satellite campus someplace. Those would be possibilities really commensurate with us." Peebles does not appear interested in selling the buildings. She says long term leases will provided needed revenue, as well as the flexibility to reclaim classroom space if needed in the future.